THIS COMPLEX WILL START AN EXTERIOR ROOF AND SIDING RENOVATION FROM LATE APRIL, 2019 THRU JULY, 2019. Come stay in our cozy two bedroom condo located in the Liftside Condominium complex. Ground level with easy access to inside parking. All safe and secure. Enter and exit from your own private deck, no need to go through the building. This condo has no units above or on either side, truly like a private home. Bring your laptop - FREE Wireless Internet. A high vaulted ceiling with an open floor plan makes this condo remarkable. No one is left out of the action with the open kitchen arrangement and great room. Over 1150 square feet of living space. View the mountains while preparing dinner in the full kitchen. The large electric fireplace takes the chill off those cool summer and cold winter nights at the convenience of a bush button, crackling sound included! No messy logs to keep adding to the fire. Turn on and forget. Relax by the fireplace with your favorite beverage! Located just outside the ground level door are the enclosed swimming pool and hot tub. Relax after a day of hiking or biking, in the heated hot tub or do some laps in the pool. Located in the Mountain House area of Keystone, you have easy access to shopping, dining, nightlife just steps from your unit. A five-minute walk to the River Run area for even more action. New restaurants and nightclubs in the River Run area along with child care. Or walk to Keystone Lodge for shopping, dining, or paddleboats on the Keystone pond. Don't forget the FREE Summit County shuttle service. Park your car and ride the shuttle to River Run, Keystone Lodge, shopping at the City Market Grocery Store, Silverthorne Factory Outlets, or to Breckenridge! This complex is a short 150 yard, five minute walk to both lifts in the Mountain House area of Keystone. Please note that snow conditions dictate which lifts and runs are open. A portion of the rental is donated to The Summit Foundation. Trip insurance is available by a third party. If interested, please ask me. One responsible renter must be at least 21 y.o. to rent, please! ALL SALES/LODGING TAXES INCLUDED IN RATES. Thanks for visiting our web site. My wife Julie and I reside in Lee's Summit,MO, just south of Kansas City. We have one son. We own our own manufacturing business in Lee's Summit, Mo. I grew up in Lee's Summit and my wife was born in Vermillion, KS, but moved often as her dad worked for the railroads. Our son works for Expedia as a programmer. Now he gets paid for what he previously was in trouble for at home when growing up! Our family started skiing again in 1988. We finally decided to purchase a condo in Keystone since we skied often. We found this 2-bedroom unit at Liftside Condominiums after a long search. We liked the convenient location, the ground level entrance and easy access plus the high ceilings, which contribute to the openness of this condo. So many units we had looked at gave the feeling of being closed in. This unit is located directly inside the parking garage so there are no stairs to climb or elevators to wait for. This unit is very quiet being there are no units located above or on either side of our condo unit. Also the easy access to outside. Being a ground floor unit, you do not have to go through the building to go outside. The unit has two entrances. One by the parking garage and the other off the ground level deck. toilet, combination tub/shower, tub, Located just outside guest bedroom in private hall. Enjoy the mountain view from the private deck. AC not needed due to the mountain enviroment. Electric forced air and electric base boards. All linens provided: towles, wash cloths, sheets, blankets, etc. Would recommend bringing extra wash cloths. Coin operated Washer located in main hall way on first floor, up one flight of stairs. Coin operated Dryer located in main hall way on first floor, up one flight of stairs. Two vehicles are allowed on premises. There are no designated parking spaces. A parking permit is required to be visible on the vehicle at all times. Covered, heated secure garage parking. Elevator not required for access to this unit as it is on ground level. Large deck with mountain view, table & chairs. Located in the club house directly across from this unit. Even my grandkids feel at home when we stay here. I love this place! Thanks John. We love having you also. Glad they feel at home when visiting. Great location and accommodations. Close to the mountain house and easy to access! We loved our stay the property, price and owner were great! Excellent facility. Warm and inviting! Gary's place is a wonderful condominium for Keystone travelers. 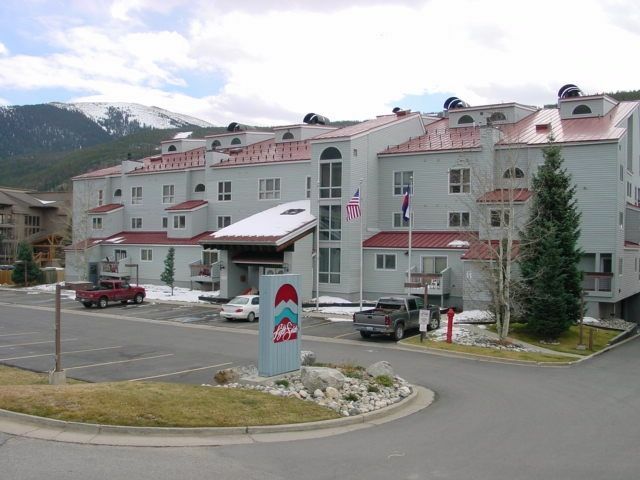 Warm and inviting with access to the slopes and the town of Keystone all within walking distance. We thoroughly enjoyed our stay in this condominium. There was plenty of room for our group of three adults and three kids. Our kids had a great time in the hot tub and pool. We would certainly stay here again. Our family of 5 visited Keystone for a ski vacation. Gary's place was warm and welcoming, and we enjoyed the gas fireplace. It was very clean, and well-equipped as we prepared several meals during our stay. There were plenty of blankets, which were a bonus considering there was a loss of power throughout the Keystone/Breck area one morning. The power did return at 10 am. The biggest bonus was the ability to walk to the Mountainhouse base and to be able to jump on the lift. Another plus was the heated garage. We are hoping to return one day. The place was well kept; roomy; and had a personal touch. 1. Rates are subject to change until confirmed. 2. For stays not meeting minimum number of night, click on "email manager" for a quote and availability. 3. Must be 21 or older to book. 4. Cleaning fee is for normal cleaning. When additional cleaning is required from extremely dirty conditions additional fee will apply. 5. All sales/lodging taxes included in rates. Sales/lodging tax certificate posted in condo unit. 6. For stays less than 3 nights additional cleaning fee of $50 will be added.